To access GQueues sign in with your Google email address (@gmail.com) and password. GQueues uses Google's secure authentication system built on the OAuth 2.0 protocol. This allows you to securely sign in to GQueues without giving GQueues access to your Google credentials. 1. On the home page, click the Sign In button. 2. You are taken to a Google Sign In page where you can enter your Gmail address and password and click Sign In. 3. You are then redirected back to GQueues and signed in with your Google Account. Installing GQueues on your Google Account is FREE and highly recommended. 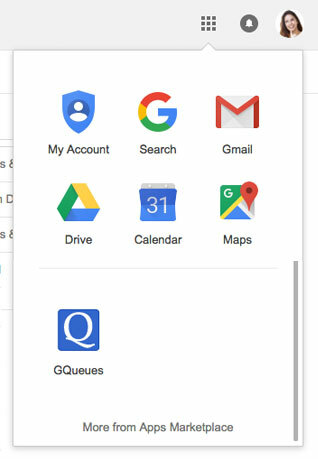 Once installed, GQueues will appear in your Apps menu giving you quick access to GQueues from other Google products such as Gmail, Drive and Calendar. Follow the steps below to uninstall GQueues from your Google Account. 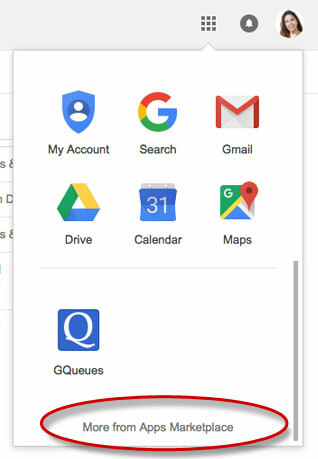 This will NOT delete your GQueues account or any of your data, it just removes GQueues from your Google Account so it no longer shows up in the Apps menu.